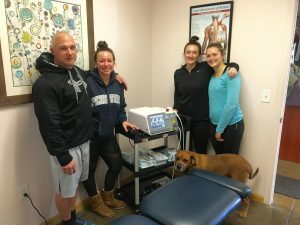 Makefield Chiropractic upgrades from K-Laser to an exciting New Diowave 60 watt laser! Congratulations to Dr. Tom Sangiorgio and his staff of Newtown, Pa on their laser upgrade from a 12 Watt K-Laser to the Diowave 60 Watt Mega Laser. They can now more effectively and quickly treat not just musculoskeletal pathologies but wounds, skin conditions, and burns as well. Our Diowave Lasers offer power levels into Cold Laser levels up to 60 watts which is the most powerful laser offered in the world. This offers the most treatment options and versatility possible. The pup in the picture is happy as well because the Diowave lasers also offer VET protocols. Thanks for your business and best wishes to Makefield Chiropractic! https://bryanne.com/wp-content/uploads/2014/04/bryanne-logo.png 0 0 Courtney Buffy https://bryanne.com/wp-content/uploads/2014/04/bryanne-logo.png Courtney Buffy2016-12-22 21:08:462016-12-22 21:08:46Makefield Chiropractic upgrades from K-Laser to an exciting New Diowave 60 watt laser! Merrow Chiropractic adds Intensity 4ch Stim Combo Unit to clinic! Integrity Chiropractic upgrades entire clinic!